Bruce luxury launches have a classic, time-less design strongly reminiscent of the Antique and Classic launches of yesteryear. Classic they are but antiques they are certainly not! We hand build them using the very latest in composite materials technology and combine that with traditional mahogany floor and seats with a mahogany deck. This is a family launch that will pass from one generation to the next, and many more, in a timeless fashion. 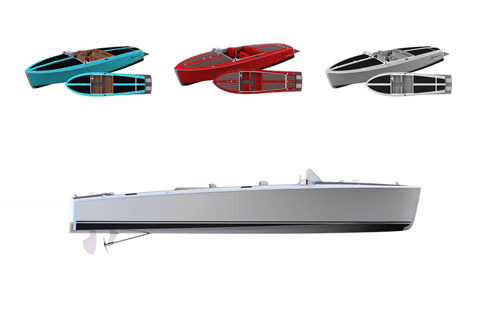 This high performance electric boat takes its name from the famous naval architect Ian Bruce, the creator of the Laser boat. The heart of the Bruce 22 is an electric propulsion system powered by the same Panasonic batteries as Tesla. We use a closed-loop, water-cooled permanent magnet motor with digital settings. 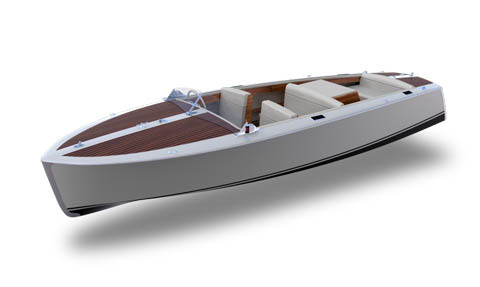 The Bruce 22 was inspired by the Chris-Craft 1947 classic design. The hull and deck construction of this Electric Runabout is the same than the Classic Utility style. Reaching a top speed of 65 km/h, it is now possible to practice your favorite water sports with this electric boat. Bruce 22 is unmatched in the market with stunning performance. * The displayed speed concern the Bruce Hatchback and Open Utility only. The Bruce T has a maximum speed of 11 km/h (7 mph) and a cruising speed of 8.05 km/h (5 mph). ** The 100 KW/h motor is exclusive to the Bruce Hatchback and Open Utility.